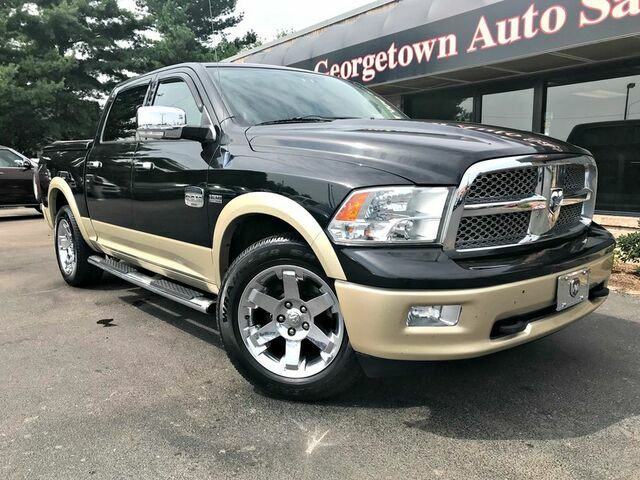 Carfax shows NO accidents, two previous owners, Baseball glove interior color, 4x4, Navigation, back-up camera, Crew Cab, laramie, towing package. The exterior is in excellent condition, no dings, dents, or major blemishes of any kind. The interior does have some wear on the front seats, which is typical for the saddle color interior. There isn't any rips or tears, but does have some wear. The tires are good, is equipped with hard bed cover, heated seats, and towing package. Welcome to Georgetown Auto Sales! We have been open since 1994 and going on 25 years in business with the same ownership. We are as transparent as possible. We strive ourselves on taking a large amount of pictures and video of our vehicles so you know exactly what you are looking at when you get here. Call for a personalized video. Visit us online on google, facebook or cars.com to see our large amount of reviews. We want you to know about us and how we do business. Give us a call at 502-863-1347.